position of not to release him from prison. write simply that Marco is a revolutionary anarchist. for the justice, they clearly want to see him behind bars. Jane asked her supporters to share this representation of her so you can see her as the person that those of us who know her best do: a teenager who wants to smile with friends, shop for prom dresses with Janet Mock, and have a family to love her. She wants you to see her this way because today is the 65th day that she has been in prison at an adult facility despite never having been charged with a crime or convicted of one. Over 18,681 people have now petitioned the Connecticut Department of Children and Families to demand Jane Doe be released, and this week Katie Couric had Laverne Cox, Tiq Milan and Chase Strangio on to discuss Jane’s case. Yet she still remains in prison. 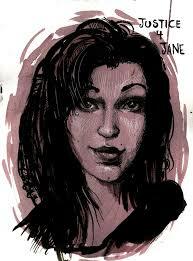 Jane needs to be released from prison so that she can heal and experience the love and support that she deserves. Jane is a teenager with dreams whose humanity we cannot forget and she needs our help to make that happen. Join us demand her immediate release! Jane needs letters of love and support for her struggle. Email justice4janect@gmail.com with the subject “Letter for Jane Doe” and the #JusticeForJane organizers will get your letter to her attorney, who can get it to her. Print & fill in this sign (or write your own! ), take a picture & upload it to Twitter, Tumblr & other social media with the #JusticeForJane hashtag. Some ideas: I demand #JusticeForJane because 65 days in prison without charges is too much! I demand #JusticeForJane because mass incarceration destroys lives & families. I demand #JusticeForJane because no one should be punished for defending themselves. I demand #JusticeForJane because DCF has a responsibility to care for children, not abuse and lock them up! Call Governor Malloy at 860-566-4840. Sample message: I’m calling to demand that Joette Katz and Governor Malloy take action to immediately release Jane Doe, the 16-year-old trans girl who’s been kept at York Correctional for 65 days now without charges. It’s an outrage that DCF and the State of Connecticut are responding to abuse by torturing the victim instead of giving Jane a safe environment. How did your calls go? Reply to this post, tweet with #JusticeForJane or @Justice4JaneCT on Twitter and let us know.
.@CTDCF, @GovMalloyOffice: 65 days in prison is 65 days too many! #JusticeForJane means releasing her to a safe & caring environment now!